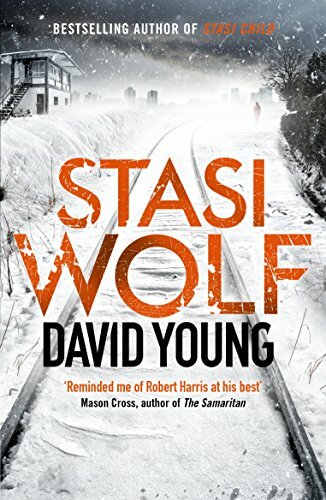 It’s difficult to review Stasi Wolf without spoilers, but here goes. This is the second in a series of thrillers set in 1970s East Germany from the British writer David Young. The first, Stasi Child (which I haven’t read) achieved stellar sales. I’m fascinated by the German Democratic Republic but fiction set in the former state that is available in English tends to be a Cold War spy extravaganza or a polemic about the relationship between the GDR and its citizens. Frankly, I am hoping for something different. Whether that’s realistic in a novel with the word ‘Stasi’ in its title is at first unclear. There are two problems I encounter. The first is in my own head. 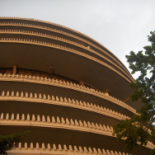 There are plenty of clues that point to a state conspiracy and betrayal. I’m quite sensitised towards this and I don’t really enjoy it. It transpires that I should have had more faith in the author who walks a very precise line: he’s promised us a police procedure with some Stasi thrown in, and that’s what he gives us. The storyline is about child snatching – just as it says on the back cover – and the themes are universal human concerns that just happen to be dramatised in the model city of Halle-Neustadt. That bit’s OK, but Young gives us a slightly different problem. In providing a plot which skilfully avoids cliché, and which includes some nods to real life crimes, he also gives us a story in which coincidences are implausible and the twist at the end takes things just the wrong side of believable. I’m not sure whether that’s too much of a problem, and that in itself provides a warning. Young’s research is meticulous (there’s an appendix stating where he has taken liberties) and he is scrupulous in taking a neutral-ish approach. Yet although we see plenty of examples of what ‘real life’ was like for the citizens of Ha-Neu, we do so as tourists gawping at the exotic. Partly that is because the protagonist, Karin Müller, is herself unfamiliar with the quirky new city, pining for her beloved Hauptstadt. However, Müller is an excellent creation who shines as brightly as an East Berlin Ampelmann. We root for her as she navigates the barriers erected by her Stasi opponents who don’t want her to solve the case. She seems to take pride in the GDR’s progress, but she is not starry-eyed about its practices. In that, she seems to symbolise the citizen who, while denying (though not openly) the GDR’s legitimacy as a state, made a reasonable life within its borders. And if much of the enjoyment of this novel comes from its setting ‘elsewhere’, this is no bad thing. From historical drama to Nordic Noir, almost all fiction is by definition from ‘elsewhere’ whether set in time or place, and since I don’t remember being this fussy about other works this is clearly my issue rather than the author’s. I hope there will be more in this series. Indeed, what I would like David Young to consider as a sequel is a cat-and-mouse hunt through the halls of the amazing and now sadly demolished Palace of the Republic, culminating in a showdown either in the Volkskammer or by that weird glass flower. What was that about ‘just the wrong side of believable’? This entry was posted on 21 March 2017 by Cafe thinking in Book reviews, German Democratic Republic, Reviews, Uncategorized and tagged David Young, DDR.